The new Pixel 2 and Pixel 2 XL offer a perfect showcase for Android Oreo and the Google Assistant — and for businesses, the peace of mind that comes with prompt OS updates. Google's new Pixel 2 smartphone is out and our reviewer, Dan Rosenbaum, has the details on what it's like to use – and whether it might tempt an iPhone user to switch. One of the great attractions of Google’s Pixel phones is that they are almost iPhone-like in concept: The same company is in full control of the hardware, software and ecosystem. And, often, a new phone is accompanied by a new release of the Android operating system, with the promise that it will get prompt OS updates for at least the next few generations. With other phone manufacturers typically taking weeks or months to roll out Android updates, the Pixel’s first-in-line status for new features and security fixes makes it an attractive choice for the enterprise. The just-released Pixel 2 and Pixel 2 XL from Google showcase the brand new Android 8.0 (Oreo) operating system in what could reasonably be called a reference design, with hardly any carrier cruft or manufacturer UI overlay. The hardware is unmistakably made by HTC, as were the earlier Pixels, and if the $1.1 billion that Google splashed out to hire a bunch of HTC engineers means that we can expect more phones like these, it would be money well spent. There are, as has become customary in top-spec phones, two versions of the Pixel 2: regular and XL. The regular is 5.74 in. long by 2.74 in. wide by 0.31 in. thick, or about 1/8 in. shorter than a Samsung Galaxy S8 and about 1/4 in. shorter and a touch wider than an iPhone 8. The Pixel 2 XL measures 6.22 x 3.02 x 0.31 in. — a touch narrower than the Galaxy S8+ and almost exactly the same size as an iPhone 8 Plus. The Pixel 2 XL comes in two colors: Just Black (a real, deep, grand-piano black — none of this “dark gray” nonsense) and Black & White. 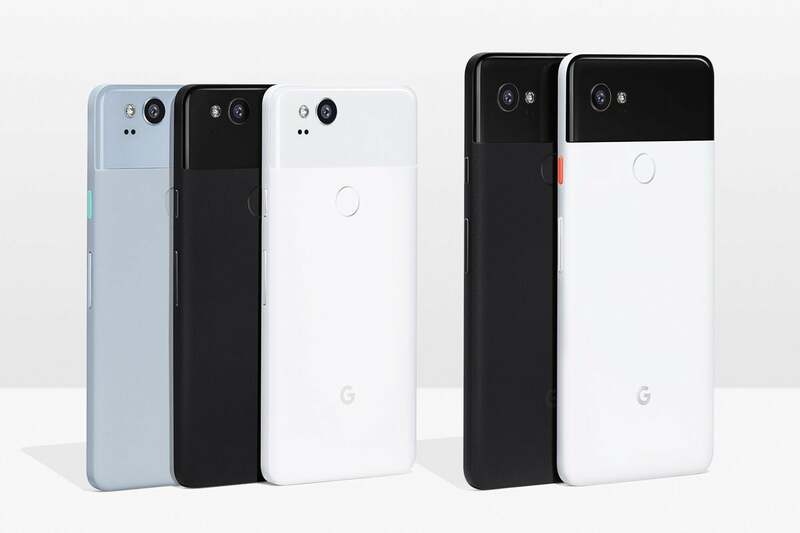 The smaller Pixel 2 comes in Just Black, Clearly White, and Kinda Blue (a pale, slaty blue-gray). Although the phones are carrier-exclusive to Verizon, you can buy them direct from Google and they’ll work on Sprint or any GSM carrier, including Google’s own Project Fi. I reviewed a black Pixel 2 XL on the Verizon network. In an age where most high-end phones are either fully glass-clad or made of slick, slippery metal, the first thing you will notice about either Pixel 2 phone is that the sides and the lower three-quarters of the back are made from grippy, matte aluminum. It’s a pleasure to hold, and it doesn’t make you feel like the phone’s going to pop out of your hand like a watermelon seed if you’re not careful. That the matte metal doesn’t pick up fingerprints is a win for the fastidious. I’m not a huge fan of big phones, but this one felt secure to handle. Ports are minimal. The SIM drawer is on the left edge, the power switch and volume rocker are on the right, and the USB-C port is on the bottom. As with most HTC-made phones, the fingerprint sensor is on the back center, near the top of the phone. There are slits for stereo speakers in the top and bottom bezels; presumably, the bottom speaker doubles as mic. Careful readers will have inferred correctly that there is no headphone jack; a USB-C to 3.5mm adapter is included in the box, and you’re otherwise supposed to rely on Bluetooth. The Pixel 2s support Bluetooth 5.0, which features faster pairing than earlier versions. Google has initiated a “Made for Google” campaign that is (among other things) designed to encourage peripheral makers to incorporate circuits that make pairing essentially invisible. A set of Libratone Qadapt Bluetooth headphones that Google sent me to demonstrate the point paired easily enough, but the process wasn’t any more transparent than pairing any other set of Bluetooth headphones. Screens on both phones are OLED and covered by Gorilla Glass 5: a 6-in. diagonal screen that displays 1440 x 2880 pixels on the XL, a 5-in. screen that displays 1080 x 1920 pixels on the smaller version. The side bezels are 1/8-in. wide on both; the top and bottom bezels are roughly 3/8 in. tall on the XL and 5/8 in. on the regular Pixel 2. At 441ppi, the smaller phone’s pixel density is lower than the Galaxy S8 and higher than the Phone 8; the XL’s 538ppi screen is slightly denser than the S8+ and much more dense than the iPhone 8+. The phones carry IP67 certification; you can leave them in a meter of water for 30 minutes without harm, but really — who does that? The Pixel 2s pack a powerful processor from Qualcomm — the high-end 8-core Snapdragon 635 — along with 4GB of RAM, and either 64 or 128GB of storage. The GPU is an Adreno 540, a standard high-end item. There’s no provision for expansion; Google says if you need more room, Android 8.0 will automatically send your stuff to the cloud. As you might expect from those components, the Pixel 2 XL benchmarks well. The Antutu suite of tests won’t yet run on Oreo, so I used the PassMark suite, which provided comparisons to the Pixel’s peer group. The PassMark score of 13935 is slightly but not significantly ahead of its competition: the HTC U11, the OnePlus 5 and the Samsung Galaxy 8+ and Note 8. Those objective results support my subjective impression that the Pixel 2 performs the way a high-end phone should. Startup is quick, pages scroll well, the screen is responsive and updates quickly, and the phone as a whole works smoothly. A full-brightness video loop took more than 12 hours to drain the XL’s 3250mAh battery, but note that the test didn’t hit any of the radios, which are a major power sink. That said, I’d expect that getting a full day’s work out of this phone should not be a problem. The Pixel 2s support fast charging with the included power brick and USB-C cable. A zero-to-100% charge took just 3 hours, but there are some interesting details there. The Pixel 2 XL charged to 40% in just 15 minutes, then sat at that charging level for 15 minutes. It then took another 20 minutes to reach 80%, where it rested for an hour. The last 20% of the charge took another hour. My guess is that the designers wanted to be able to get you up and going quickly (hence the 40% in 15 minutes), but realized that pushing so much power into a battery so fast might cause all kinds of heat-related problems they would rather avoid. When Google announced the Pixel 2 earlier this year, the company made a big deal out of artificial intelligence being baked into the Android ecosystem. It very well may be, and there’s no doubt that the Pixel phones — like the several Google Home devices available now or soon shipping — are vital as voice-control endpoints in that ecosystem. That makes the Google Assistant, as the voice interface to Google’s AI ambitions, absolutely central to the company. Because Oreo is so new and there are so few phones running it right now, it’s hard to tell if the Pixel 2’s success with the Assistant is because of Oreo alone, the phone alone, or the interaction between the two. Whichever it is, the Google Assistant on the Pixel 2 shines. You can launch the Assistant simply by squeezing the sides of the phone. Voice recognition is fast and accurate, and answers are relevant and quick to come. The Google Assistant, I think, is now the best voice-controlled information resource, although it still trails Amazon’s Alexa in the span of smart-home controls. But ask me again next month, and I’ll probably have changed my mind. One neat AI application on the Pixel 2 phones is a Now Playing function that can display on the lock screen the name and artist of the song that’s playing around you, without your having to ask. Turn on the feature, and Google downloads in the background (over Wi-Fi, so no data charge) a database that lets the phone recognize “tens of thousands” of songs. The database is refreshed every week, a Google spokeswoman said. It’s unexpectedly neat, although the database biases heavily (as it ought to) toward the most popular music today. It didn’t pick up Charlie Parker’s “Lester Leaps In,” or The Troggs’ “Wild Thing,” although the Google Assistant, asked directly, had no problem with either. Another AI feature on the Pixel 2s is Google Lens, which identifies and expands upon photos you take. It works pretty well, even in early days. Google looked at photo of a bag of almonds from local supermarket, dug out the store’s address, and identified the contents correctly. A photo of Roger Angell’s book Season Ticket pulled up a short review from Google Books. A Kirkland brand AA battery caused Lens to show information about Costco at first (very smart: Kirkland is Costco’s house brand) but later attempts told me only about Kirkland, Wash. Lens was defeated by a generic bag of metal screws from the hardware store down the block, as well as by the individual screws. So should you buy one? As reviewed, the Pixel 2 XL with 64GB of storage on the Verizon network costs $849. The smaller Pixel 2 costs $649, and boosting memory to 128GB adds $100 to either phone. (The prices are the same for unlocked phones directly from Google or other retailers, although depending where you buy, there may be deals that include other Google devices.) In comparison, a Samsung Galaxy S8+ costs $840 direct from Verizon; unlocked from Best Buy, it’s $725. The Samsung is the sexier phone: all black glass with those curvy infinity edges, endlessly controllable camera, and tons of interface options you can tweak forever. But as a working phone, I think I’d pick the Pixel 2. It’s easier to hold (which counts for a lot), the Google Assistant is truly impressive, it runs Project Fi, and there’s really nothing missing from it, other than the headphone jack, that I care much about. And with a Pixel device you'll always get the latest updates and security fixes immediately — something that should be top of mind for anyone using an Android phone for business. The Pixel 2s aren’t phones to swoon over, but swooning is overrated. You’ll like using one. Dan Rosenbaum, a contributing writer for Computerworld, is president of Center Ring Media and editor in chief of Wearable Tech Insider. He’s been writing about telephones and mobile technology for more than 30 years.